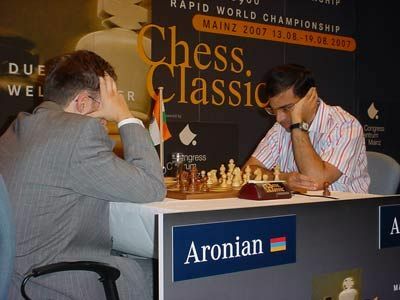 Mainz 15th AUGUST 2007 On the 60th Independence Day of India, Super Grandmaster Viswanathan Anand scored stunning victories against Rustam Kasimdzhanov and Etienne Bacrot to qualify for the finals of the Chess960 World Rapid. On the 2nd day of the Chess960 in Mainz, Anand played with White pieces against the former World Chess Champion – Uzbekistan’s Grandmaster Rustam Kasimdzhanov. Anand opened with e4 and Kasimdzhanov replied with d5 and there after the game moved on with a snail’s speed. Kasimdzhanov played very cautiously and on Anand’s 9th move, f3, Kasimdzhanov took almost 7 minutes to play Re8. 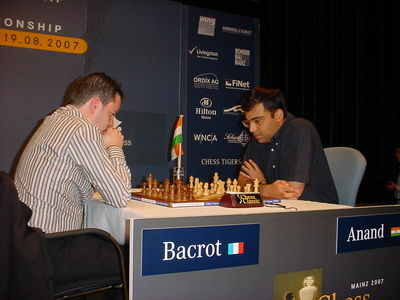 There after the computer showed all possibilities in favour of Anand, who won the game after 21 moves. This was Anand’s first ever win in Chess960 format championship. Anand converted an otherwise messy game against Etienne Bacrot in a superb ending. Playing with white, Anand played e4 again. Bacrot replied with e5. Anand, with his fresh win in the opening game of this round, played like he generally plays all his Rapid games. His grasp of this unique format was very much visible as he outclassed his opponent in all aspects of the format. After giving a check to the black king on 29th move with Rxb+, which somehow Bacrot easily averted, thereafter it was a matter of a few moves. Anand again gave check on the 34th move with Nd6+ and his final threat on the next move sealed the victory. With these two victories Anand made his way to the final. The Final game of the 2nd round against Aronian was just a necessity and after playing 18 moves the game ended in a draw. “The Third game was pretty exciting. Ok both of us knew that our qualification was set” Anand said for our correspondent Vijay Kumar. 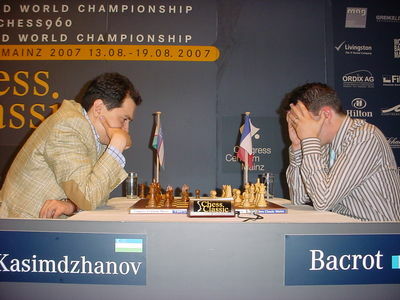 On the other table Defending Champion Levon Aronian tried hard to gain an upper hand over his opponent Etienne Bacrot, but in the end game agreed for a draw. 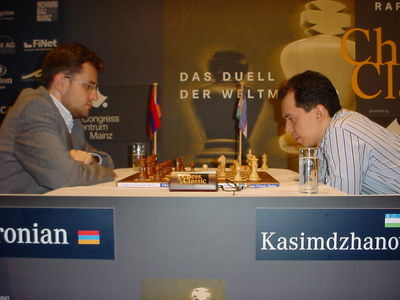 In the 2nd game Aronian defeated Kasimdzhanov while Rustam Kasimdzhanov lost to Etienne Bacrot. In the 4 games Final to be played on 16th August Anand will take on Levon Aronian .